Cat the Bride: We got engaged in April 2016 after almost 8 years together. It was pretty out of the blue, and happened on a Saturday a few days before my birthday. Ewan had snuck out that morning to buy a ring, and being the spontaneous, head strong person he is, came home that afternoon and popped the question while I was still in my dressing gown making us a late lunch of sausage sandwiches – it was an ironically perfect moment, and memorable in its silliness. We wanted the wedding to be relaxed and informal, nothing fussy (neither of us really enjoys being the centre of attention). 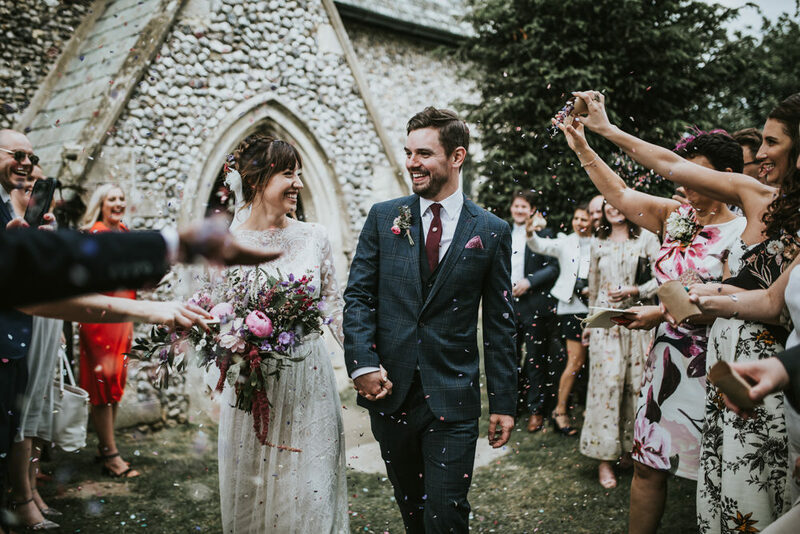 Having booked several viewings at various venues, Fishley Hall in Norfolk was the first and only venue we ended up visiting as it was perfect for us – when its right its right! Set in the middle of acres of Norfolk countryside is a tiny Saxon church, and further down the farm track is Fishley Hall and The Old Grain Barn. 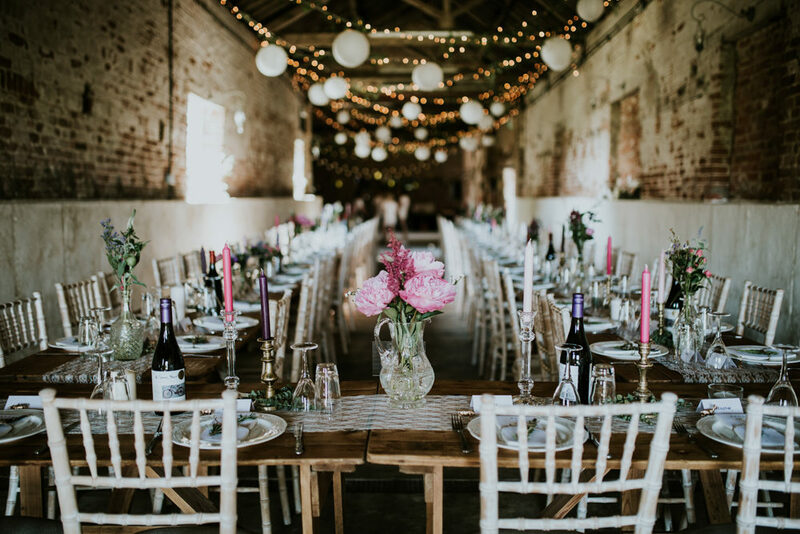 The Hall is an exceptionally restored space which sleeps 16, and was the perfect place to spend the days surrounding the wedding with both of our families. 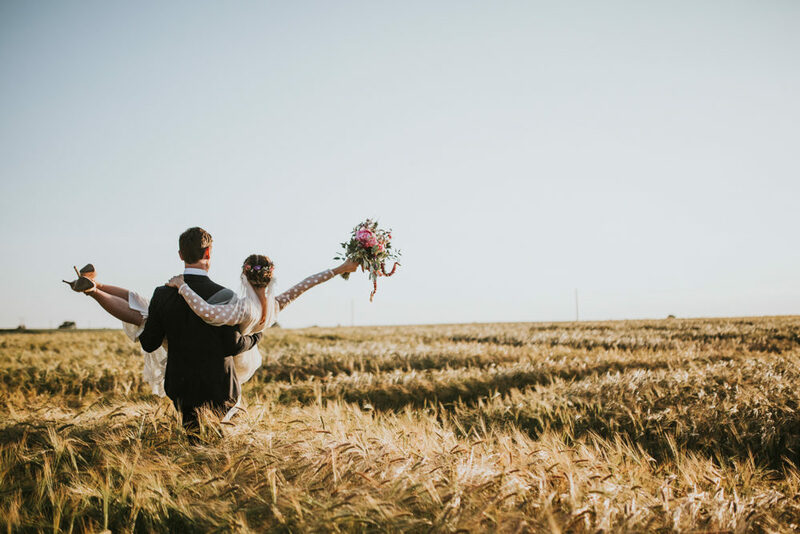 The Old Grain Barn is an untouched and totally unspoilt barn which was exactly what we were looking for – the ultimate blank canvas that’s charm does most of the hard work for you, from your first moment to the final goodbye as you reluctantly drive away from the best memories of your life. 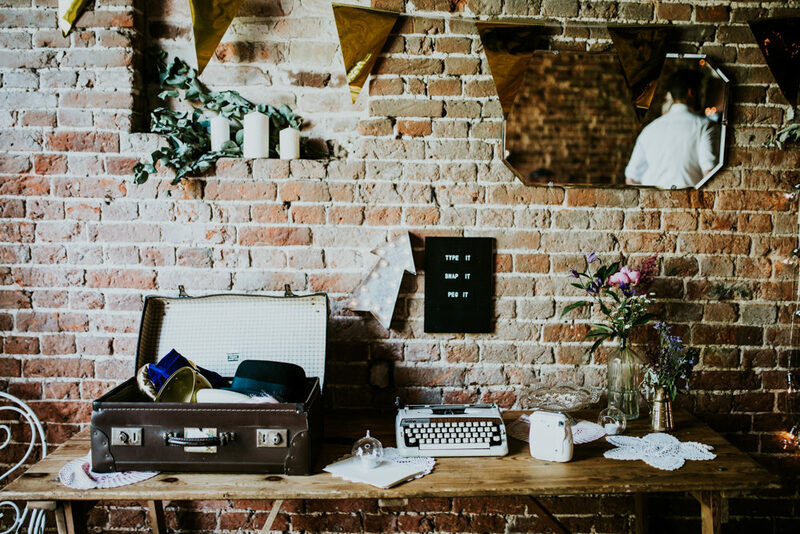 We wanted the décor to be fun, vintage and have a DIY feel – we did everything ourselves. 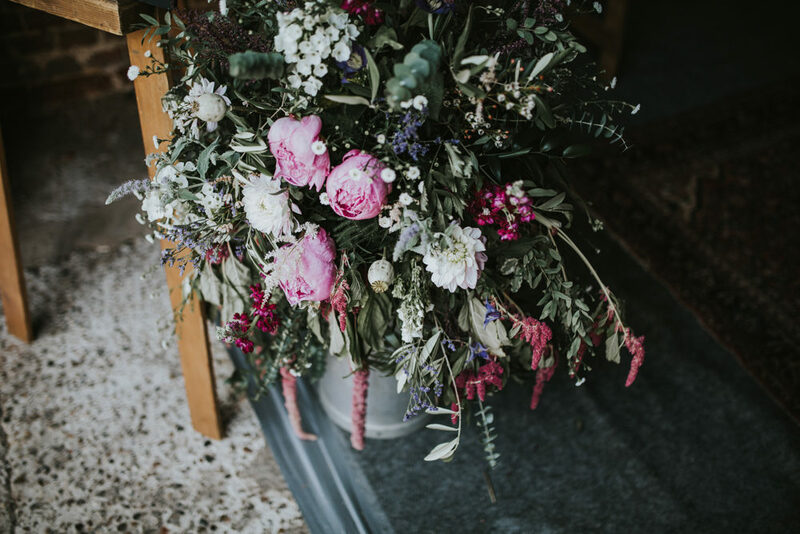 We spent many weekends heading to charity shops, vintage shops and car boot sales searching for brass candlesticks, old decanters, crochet blankets and curios of all sorts to decorate the venue with. We also enlisted the help of Penny from The Little Lending Company, who we hired the most amazing vintage Persian rugs from, lawn games and an easel and chalkboard which had our order of the day beautifully written on. 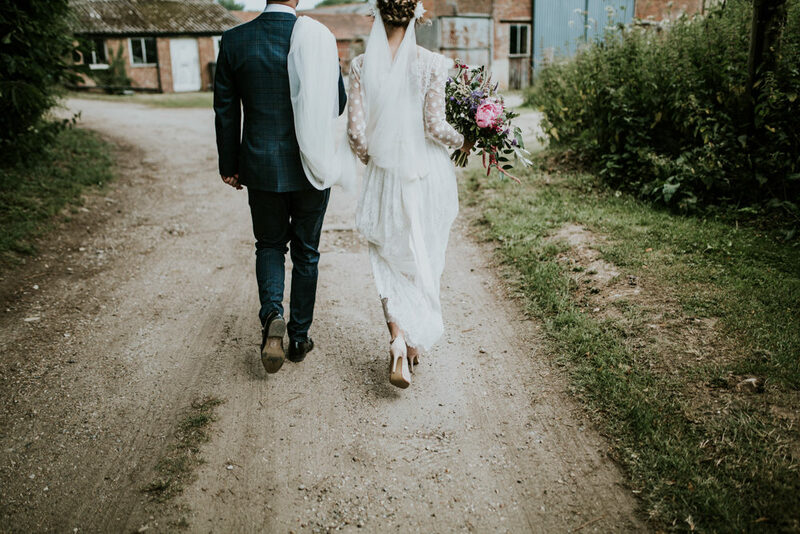 We spent 2 days getting the barn all dressed up ready for the day – knackering but so worth it! The girls from Swaffham and Fakenham florists did an absolutely incredible job of the flowers. After following them on Instagram for a little while, I was so happy when I managed to bag them for the day! We went for a colour scheme of deep pinks, purples, ivory and greens. 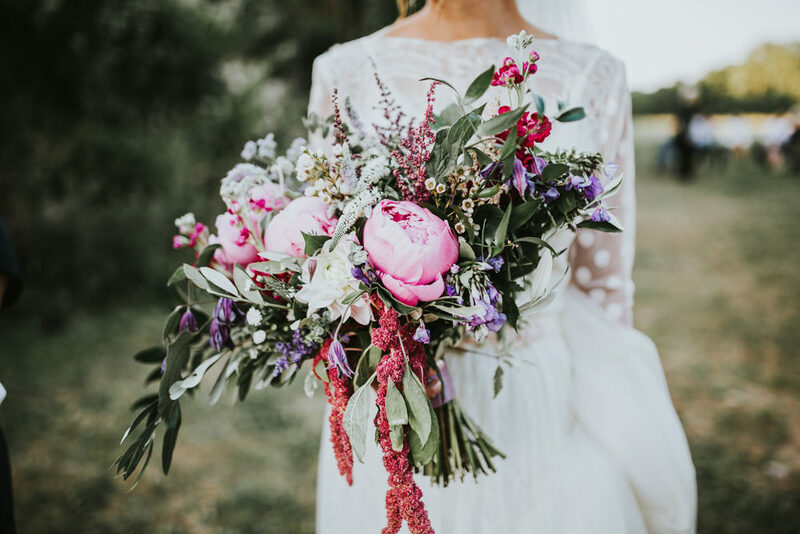 My bouquet was epic with the biggest peonies ever. When it came to my dress and the bridesmaids’, I actually bought the girls dresses before I had even looked for my own. I had always loved Needle & Thread, so when one of the dresses I had in my saved list on ASOS went into the sale I had to buy them, even though I hadn’t actually asked the girls to be my bridesmaids yet. Luckily, when I got round to asking them, they were all happy to accept and the dresses fitted them perfectly. My adorable 14 month old niece was the flower girl and wore a cute pink tutu by Bob & Blossom – she definitely stole the show. Next up was my dress, I came across Katya Katya Shehurina after many hours searching the internet. Her entire collection was amazing, so along with my mum and sister, I visited her London Boutique in August. Hazel was the first dress I tried on there and ended up being the one. 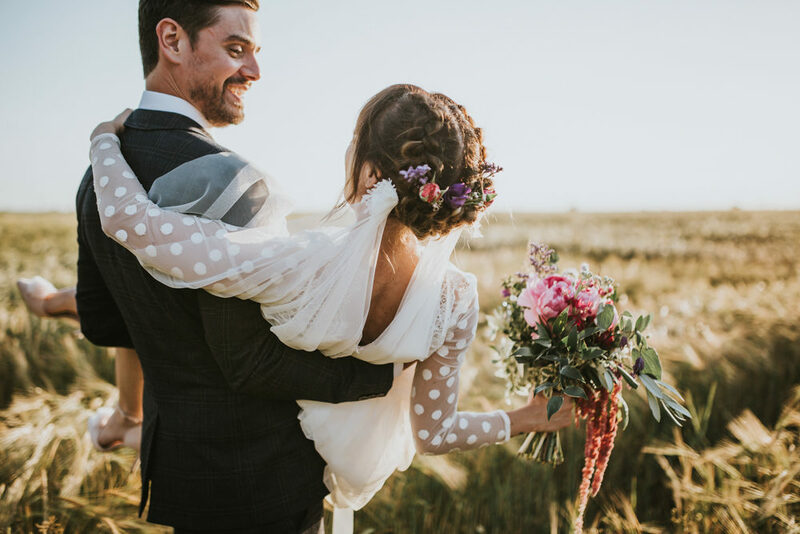 I loved the fact it felt traditional and quite vintage, but the polka dot sleeves and layered ruffles at the hem added something else to the dress. I opted for the Emma veil to finish it off, and went for some shoes from Dune with furry pom poms on. On the day, the fantastic Charlotte Victoria MUA came and helped us get ready – sorting our faces out and popping our hair into braids, transforming us all and making us feel super glammy! Ewan’s suit was from Ted Baker. He went for a classic cut in a subtle navy check. We ordered it online so had it tailored by a local seamstress, and chose simple, black monk strap shoes from Kurt Geiger, a classic white shirt and a deep, burgundy tie from Mrs Bow Tie to complete the look. The best men wore plain navy suits from ASOS and River Island, and matching ties from Topman in a similar colour to Ewan’s. After being convinced for a year that it was going to rain on the day, it ended up being one of the hottest days of the year. It was unbelievable, albeit a little sweaty too. 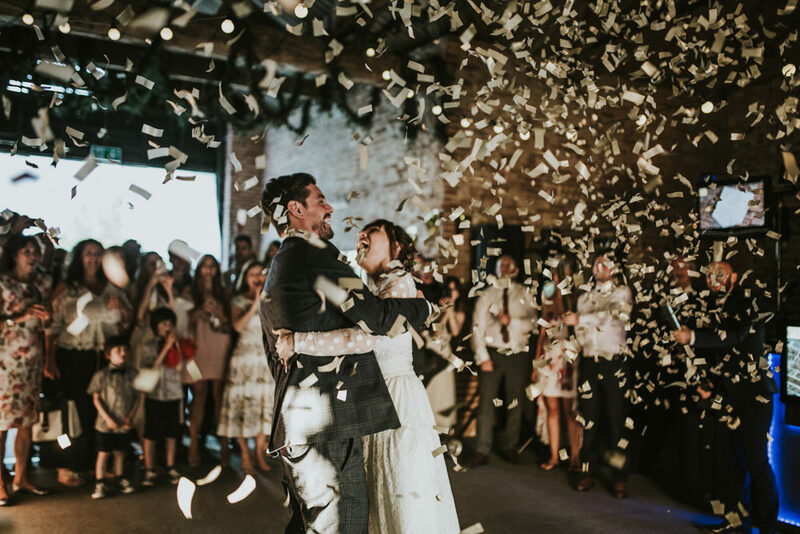 We got married in the church at 2pm, then walked down to the barn for drinks, food, dancing and games. Alex Chef did a fab job of the catering – we went for canapes with Aperol Spritz on arrival, then a spit pig with salads alongside plenty of wine and beer for the main. Dessert consisted of crepes from Christophes Crepes. 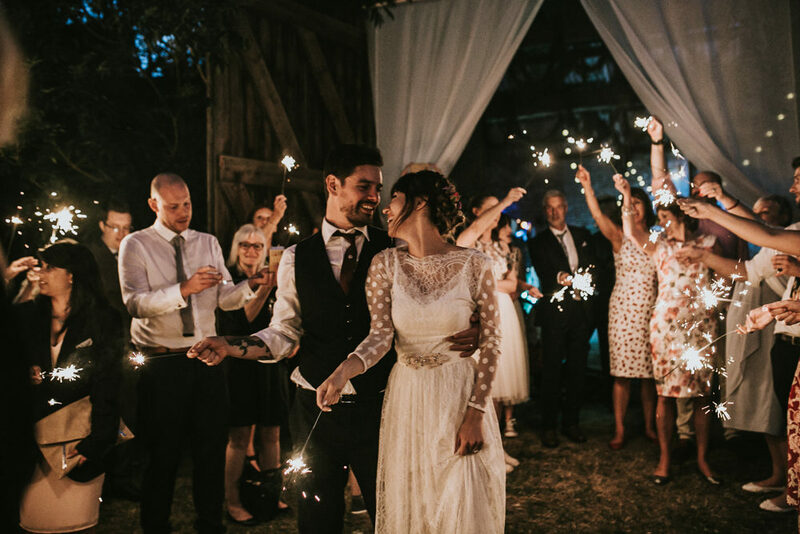 They rocked up in their vintage Citroën van and gave all the guests a real sweet treat! Ewan’s mum is an amazing baker, so she had the big job (which she smashed) of making the wedding cake. We had croquet and skittles set up on the lawn to play, alongside a huge tug of war rope. After a few drinks, everyone got well into a few games of tug of war, even thinking it was a good idea to play it over a ditch. Luckily no-one was hurt and there were only tears of laughter. Ewan is a musician, so instead of any formal, and possibly boring speeches, Ewan, his brother Ross, and friend Sam, played a few songs carefully chosen by us all. 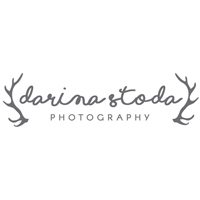 We had the incredible Darina Stoda as our photographer for the day and could not recommend her enough. She made us feel so relaxed, and felt like she was one of our guests. She was also like a little ninja on the day – most of the time we didn’t realise she was there taking our photo, until we got all the snaps back! Congratulations to Cat and Ewan. The barn setting looks awesome. Thanks for posting these beautiful pictures. They have come out really well.